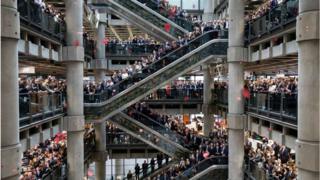 Lloyd's of London has announced a plan to tackle sexual harassment after reports that female employees face an "entrenched" culture of sexism at the insurance market. Last week women told Bloomberg and the Independent they were "leered" and "letched" at and judged on their looks. Lloyd's boss John Neal called the reports of harassment "distressing". "No one should be subjected to this sort of behaviour, and if it does happen, everyone has the right to be heard and for those responsible to be held to account." Last week Lloyd's, where hundreds of brokers and insurers meet to do business, was accused by Bloomberg Businessweek of being "the most archaic corner left in global finance". The magazine said it had spoken with 18 women who described an atmosphere of near-persistent harassment - ranging from inappropriate remarks to unwanted touching and sexual assault. The Independent followed up with a similar report, claiming that women who work at the iconic Lloyd's of London building, in Lime Street, were abused and attacked by male bosses but did not feel able to speak out due to fears of retribution. "Every time women are described it is by their looks first," one female employee was quoted as saying. "'Wear that tight top to go and get a deal done.'" She added that everything was "deemed to be banter [and] innuendo that people laughed off". Lloyd's, which was run by a woman, Dame Inga Beale, from 2014-2018, has encouraged the women quoted in media reports to share their allegations with the firm in a "safe and confidential" space. As part of its plan it hopes to increase reporting of sexism across the 331-year old market. The firm said that where individuals had a case to answer, they would be punished and could be be banned for life from entering the Lloyd's building. "I am determined that Lloyd's offers a safe and inclusive working environment for everyone," Mr Neal said.